Need ideas for a fun and super frugal DIY home decor project to get your house pretty in fall? Here’s a no carve DIY Pumpkin home decor, made out of old t-shirts and outgrown clothing. Go beyond the jack-o-lantern this year with a creative way to use pumpkins in your fall decor. You won’t have to master pumpkin carving to make these cute, easy and super quick pumpkins. All you need is a couple of old t-shirts and some other clothing items you don’t use anymore. I had this orange t-shirt I never really liked and I most likely purchased without even thinking what I’m throwing in my shopping cart. I thought about refashioning it into a new t-shirt or a dress for my little girl. But the ideas seem a bit too complicated for the mood I’m in right now (and that would be lazy; no reason to hide behind fingers, I know it and you know it!). And since it’s fall and Halloween is approaching pretty fast I thought why not making some DIY pumpkin home decor out of this t-shirt. I also found a blue t-shirt which is not fitting too well now and added that into the project too. There’s also a bunch of clothing from the days my daughter was only a couple years old so I gave those a nice purpose with this project. I’m pretty happy with the result; after only 10 minutes I got myself a nice fall home decor or a centerpiece that did not cost me a penny! How cool and frugal is that? Such a good idea! 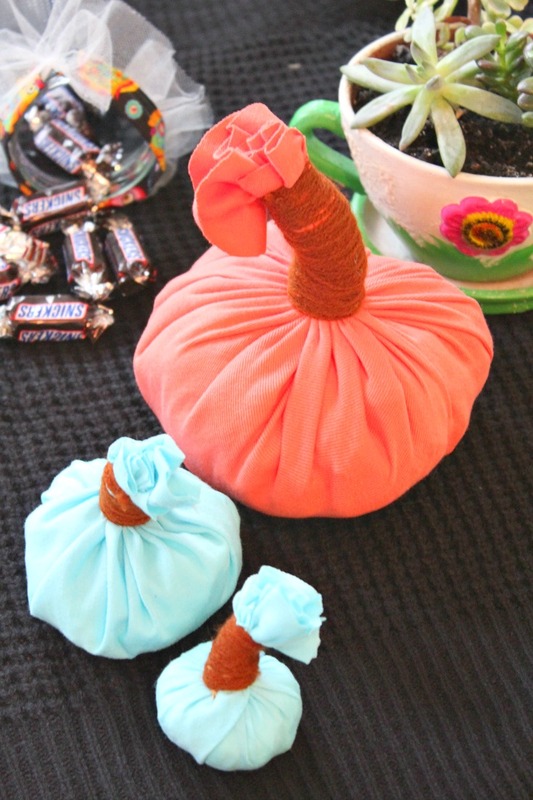 I’ve been wanting to make some fabric pumpkins but didn’t really want to go buy fabric, now I can just raid that box of old t-shirts I never wear! Problem solved! Thanks for sharing! Thanks so much for your lovely comment, Kate! Have a fabulous day!